Interested in becoming a councillor (Parish Council or Borough Council)? If so, you would need to fill out the nomination forms and submit them by 3 April 2019. 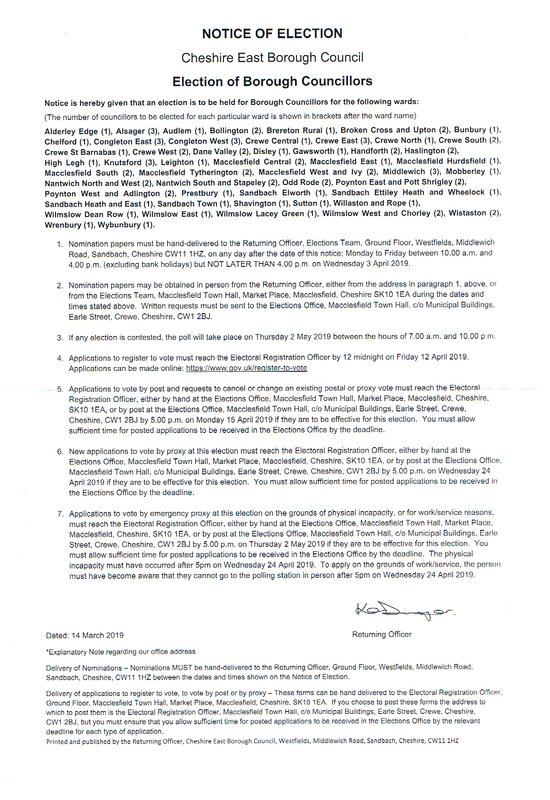 If more than 7 people are nominated for Parish Council, there will be an election on 2 May 2019, which is when the election for the Borough Councillors will be. Don’t forget to register to vote by 12 April 2019, if you are not already registered. We meet at school at 7:30. If there are any issues you’d like to raise, please contact us. Planning permission for the proposed development of 27 houses on the field off School Lane was refused by Cheshire East in October 2015. The case went to the Secretary of State for decision. On 3 April 2017, he dismissed the appeal and refused to grant planning permission. The second application for this development has also been refused by Cheshire East, on August 16 2017. The developers have appealed this decision, and the planned start date for the Inquiry is 19 November 2019. Sign up to get email alerts from Cheshire Police here. Urgent calls, as always, use 999, but for non-urgent calls, use 101. Contact our local Policing Unit on macclesfield.lpu@cheshire. Copyright Marton Parish Council 2019. All rights reserved.